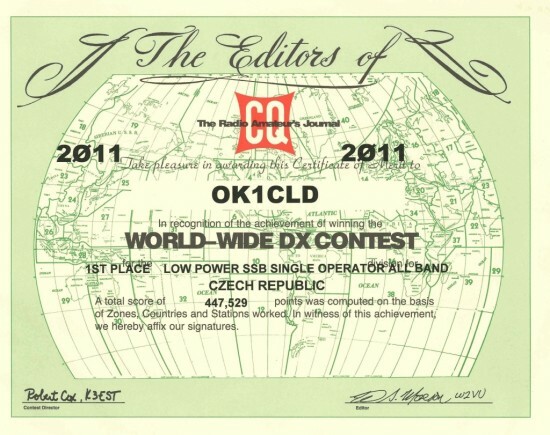 Last weekend I participated in CW part of CQ WW DX Contest. Since I haven’t used Morse code in last 2 years – and frankly have never been good at it – I didn’t try to reach some high score and just enjoyed the contest. However, after some time I read the callsign and answered the CQ… and 1st station was in my log! And soon a few others were following… I was amazed how well other stations were reading my signals – most of them recognized correctly my call on 1st attempt, which doesn’t happen so often to me in phone contests. During the whole contest I made 146 contacts with 33 DXCC countries and 13 CQ zones, most of them on 20 meters band. I was a little disappointed that I made only 11 QSOs on 15 meters – there was quite a strong QRM, sometimes even S7-S8. On the other hand, I was pleasantly surprised by 40 meters band – for 1st time I managed to make contact with U.S. station. To sum up, I must say I really liked the CW contest and decided to work on my “Morse code reading skills” to be better next time.